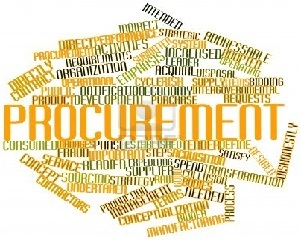 As mentioned previously, procurement covers all process from the beginning until the end to obtain goods or services. 1. Identification of goods or services as per requirement. The companies should determine what products or services required based on the plan that have been made previously. The specified type or the required specifications have been created in that plan, even most of the company already has its own standards for goods or services required. Also at this stage, the company must know it needs for the goods or services, whether that needs to be reordered or it may be a new item. 2. Conduct market survey or market assessment. Build a good relationship with suppliers. Make suppliers appraisal includes their capabilities. Get sample of goods from potential suppliers. 3. Selection and determine who will be the supplier. This activity is usually done through a bidding / tender process. However, for some cases, the companies can directly enter into contracts with suppliers without going through a tender process, of course, this is done by strictly taking into account the terms and conditions. Usually direct contract is made if the goods or service is urgently needed or it needed within a narrow time. 4. Make and placing a procurement contract or purchase order with supplier. All terms and conditions, specifications and price should be clearly stated in the procurement contract or purchase order. This contract or order should be made in two copies, each party need to keep one copy. Acknowledge receipt of contract from supplier to be kept by buyer. 5. Expediting orders as per contract or purchase order. Timely delivery is important, supplier has to notify if there is any delay. In principal, this activity should pay attention on delivery times, work completion and payment dates. 6. Receipt and inspection of purchases. The goods or services should be checked and inspected by the recipient prior sign any receiving document. The recipient could reject to receive if there is a defect or the goods/services are not same with specifications in the contract or order. Payment is made if all data and numbers in three documents are match. The receiving document, the invoice and the contract/purchase order must match. Any discrepancies must resolved before executing the payment. 8. Make supplier performance evaluation. This activity is important because the result of supplier performance evaluation will determine whether the supplier will be able to continue to be used or not. Observed performance is from the beginning since the contract / order is signed up to the invoice or payment. This performance evaluation also important for audits. All documentations should be kept in properly manner.